The World Series. Just saying the name, brings with it a bit of mysticism, romanticism, and historic personal memories. For Alex Rodriguez, his lifelong dream is about to become a reality. 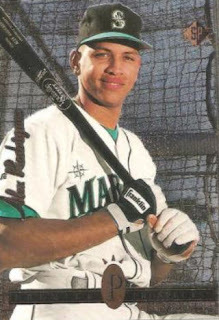 Despite a very public divorce, the admitted use of steroids, and off-season hip surgery, and a NY fan base that began to think of him as Mr. Choktober, Alex Rodriguez will be making his first ever World Series debut in the city of New York. The Big Apple, Broadway, Madison Avenue and the New York Yankees. As would be expected, their are currently no shortages of his 1994 Upper Deck SP rookie card on eBay. As of the start of this post there were 98 and I wouldn't be surprised to see even more by the time this post is published. Prices and condition vary greatly. One potential bargain I noticed is a card slabbed by BCCG as a 7.5. There are no bids. It seems people want the card raw or understandably, slabbed by a legitimate grading service instead. You might be able to pick this card up cheap and crack it out of it's case. Something to consider though, if BCCG gave it a 7.5 it could be closer to a 6. Patience is the key word here, don't just jump on the bandwagon now and get caught up in the hype. there are plenty of these cards to be had and there always will be.